Now this is what an action blockbuster is supposed to be: smart, exciting escapism entertainment that makes its audience think rather than overloading them with special effects. Mission Impossible is pure fun, starting with its intelligent, masterful plot, and carrying itself through with state-of-the-art special effects, credible acting, and relatable characters that have a purpose in the conflicts they are going through. You don’t have that many movies where the characters are as fleshed out as the action is. Mission Impossible follows the perspective of a young agent named Ethan Hunt (Tom Cruise) who works for a secret agency known as the IMF. His leader, James Phelps (Jon Voight), is given a mission to capture a fugitive who is after the “Noc List”, a file that categorizes every IMF agent working undercover in the field. If the Noc list ever got into criminal hands, many IMF agents’ lives would be in danger. That’s where Phelps and his team come in: their mission is to capture this thief on-camera stealing the Noc list, follow him to a meeting with his buyer, and apprehend the both of them. The mission goes desperately wrong. One by one, Ethan’s team is killed off, and Ethan is the only one to walk away. Now, IMF believes he is a traitor because the thief got away from Ethan Scott-free. Now alone with no backup and no resources, Ethan has to not only recover the Noc list, but also find out who is responsible for his team’s mission failure, as well as clear his name for the crimes he didn’t commit. Here is a spy movie lived to its fullest. Going undercover in tuxedoes and bow ties while sipping martinis and champagne, these spies use their wits, not their weaponry, to outsmart their foes. And their weaponry itself… dear lord. They utilize such a wide array of complicated spy equipment that would floor anyone who would just take a glance at them. What we have here isn’t just guns, pistols, and radar jammers: we also have trip wires, laser security, balance beams, harnesses, suction gloves, and these latex masks that allow agents to copy the facial features of another person. There is a lot of spy tech and gear for the characters to play around with in this movie, and boy, do they play around with it. With such tools at a spy’s disposal, you can only infer how good the action looks. They are as explosive and action-packed as a James Bond movie is, and as exciting and surreal as a Tom Clancy thriller. Here is a movie that holds nothing back. It lets loose freely in its field of CGI and special effects, and the result is the most spectacular because of it. I can recall a few moments in this film that can be called iconic by right. My favorite, interestingly enough, has to be one of the film’s most quiet moments: an espionage scene where Ethan is slipping into a room that has motion sensors, pressure sensors, audio sensors, laser sensors, really anything with the word “sensor” in it. This is the scene where the movie earns the right to call itself Mission Impossible, because that’s exactly what this mission is: impossible. Except for the fact that Ethan and his team pull it off. But action without plot is like frosting without the cake. I’m a picky viewer. For me, there needs to be a reason, and a good reason, for all of the action and explosions to be taking place in the film. 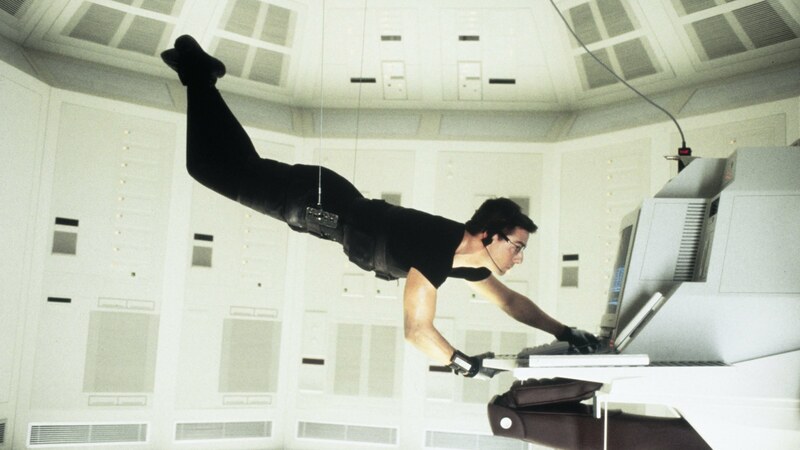 Mission Impossible is a different action movie because of this. Its plot is complex, deep, deceptive, weighty, and manipulative, a plot that twists and turns and scurries about in all directions all while maintaining its narrative and purpose in a consistent, healthy flow. I expect many viewers will be confused and irritated by how much writer Robert Towne is making them think. They need to step back and actually analyze the movie they’re watching for a change. Mission Impossible is well worth the analysis. This is a movie that doesn’t cheat, and it doesn’t rob you of anything from this experience. There are few movies I have seen where the plot and the characters match the appeal already provided by the special effects and explosions on the screen. Here is a movie where the story exceeds the visual effects. Director Brian De Palma utilized this film’s premise to its fullest, and gave actual meaning behind the plot and the spectacular action sequences we see in this movie. Here is a film that is truly one of its kind. It is perhaps one of the best action films I have ever seen.